Even if you don't hear the Giants' home run call "Bye Bye, Baby!" 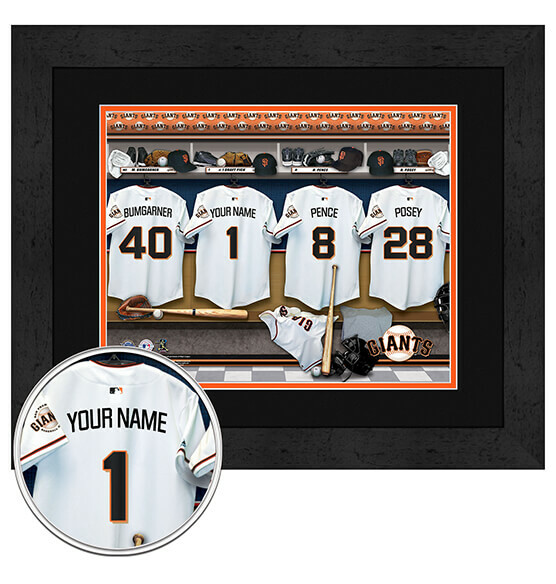 applied to your four-bagger, you can still be part of the San Francisco Giants in name thanks to our Personalized Locker Room Framed Wall Art. This high-quality MLB baseball sports decor has a digital double mat that features Giants team colors as well as a sleek black frame that will look great anywhere. An awesome gift for the San Francisco Giants superfans in your life, this easily customizable full-color print allows them to see their name on the back of a Giants jersey. Hit your gift-giving out of the park with custom San Francisco Giants gifts from PersonalizedThings by Exposures.